The prototype glatiramoid, Copaxone, (Teva Pharmaceutical Industry) is a complex heterogenous mixture of synthetic proteins and polypeptide nanoparticles with immunomodulatory activity approved for treatment of relapsing-remitting multiple sclerosis (RRMS) [10,47–50]. The active ingredient in Copaxone, glatiramer acetate, comprises a potentially incalculable number of unidentified active peptide moieties that are not characterizable with available technology , although the amino acid sequences in Copaxone are not entirely random ). The mechanism of action of Copaxone is not fully elucidated but the drug is thought to act as an antigen-based therapeutic vaccine [51–53]. Pharmacokinetic data are uninformative for glatiramoids because the polypeptides in a glatiramoid mixture are hydrolysed at the drug injection site into unidentifiable peptide fragments that stimulate proliferation of glatiramoid-specific immune cells, which migrate to the central nervous system where they ameliorate auto-immune destruction of myelin [54, 55]. Therefore, blood levels of the glatiramoid or its hydrolysis products are not indicative of drug activity. A purported follow-on product of glatiramer acetate is currently marketed in India and the Ukraine (Glatimer, Natco Pharma Ltd, Hyderabad, India). There are no published data of the safety, efficacy, or immunogenicity of this product at this writing. In analytical tests, this product demonstrated physicochemical differences from Copaxone and poor batch-to-batch reproducibility [8, 20, 64]. 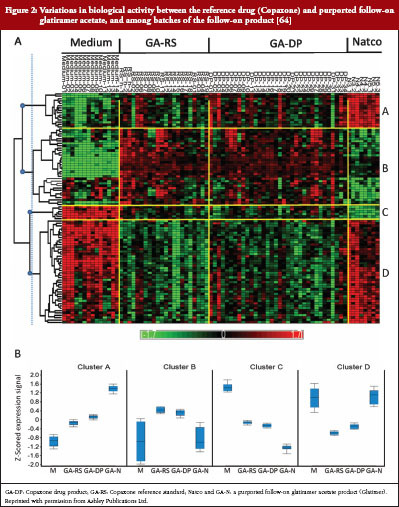 When activatedex vivo with Glatimer, splenocytes from GA-treated mice showed distinctly different gene transcription profiles among different batches, and between Glatimer and Copaxone, see Figure 2 . Ocular drug delivery is a very challenging field for pharmaceutical scientists. The unique structure of the eye restricts the entry of drug molecules at the required site of action. The eye and its drugs are classically divided into : Anterior and Posterior segments (1). Conventional systems like eye drops, suspensions and ointments cannot be considered optimal in the treatment of vision threatening ocular diseases yet more than 90% of the marketed ophthalmic formulations are in the form of eye drops. Thus resulting in low ocular bioavailability of drugs with less than 5% of the drugs entering the eye. Recently many drug efflux pumps have been identified and significant enhancement in ocular drug absorption was achieved following their inhibition or evasion. But prolonged use of such inhibitors may result in undesirable effects. The success of nanoparticle systems for ocular drug delivery may depend on optimizing lipophilic-hydrophilic properties of the polymer-drug system, optimizing rates of biodegradation, and safety. Polymers used for the preparation of nanoparticles should be mucoadhesive and biocompatible. The choice of polymer plays an important role in the release kinetics of the drug from a nanoparticle system (4). The choice of polymer plays an important role in the release kinetics of the drug from a nanoparticle system. Ocular bioavailability from a mucoadhesive dosage form will depend on the polymer’s bioadhesion characteristics, which are affected by its swelling properties, hydration time, molecular weight, and degree of crosslinking. The binding of drug depends on the physicochemical properties of the molecule as well as of the nanoparticle polymer, and also on the manufacturing process for these nanoparticle systems (4). The viscosity enhancers used are hydrophilic polymers such as cellulose, polyalcohol and polyacrylic acid. Sodium carboxy methyl cellulose is one of the most important mucoadhesion polymers having mono adhesive strength. Viscosity vehicles increases the contact time and no marked sustaining effect are seen. Prodrugs enhance comeal drug permeability through modification of the hydrophilic or lipophilicity of the drug . The method includes modification of chemical structure of the drug molecule, thus making it selective, site specific and a safe ocular drug delivery system. Drugs with increased penetrability through prodrug formulations are epinephrine1, phenylephrine, timolol, and pilocarpine. The main indication of these drugs is to treat glaucoma thought epinephrine1 and phenylephrine are also being used to treat redness of the eye and/or part of dialing eye-drops. Nanoparticles provide sustained release-and prolonged therapeutic activity when retained in the cul-de-sac after topical administration and the entrapped drug must be released from the particles at an appropriate rate. Most commonly used polymers are venous poly (alkyl cyanoacrylates), poly Scaprolactone and polylactic-co-glycolic acid, which undergo hydrolysis in tears. Enhanced permeation across the cornea was also observed when poly (epsilon-caprolactone) nanoparticles were coated with polyethylene glycol. Liposomes are lipid vesicles containing aqueous core which have been widely exploited in ocular delivery for various drug molecules.Liposomes are favorable for lipophilic drugs and not for-hydrophilic drugs. 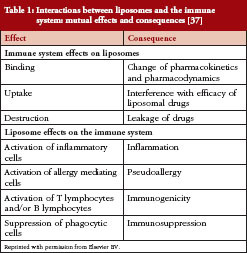 liposomes has an affinity to bind to, ocular surfaces, and release contents at optimal rates. Coating with bioadhesive polymers to liposomes, prolong the precomea retention of liposomes. Carbopol 1342-coated pilocarpine containing liposomes were shown to produce a longer duration of action. Ciprofloxacin (CPFX) was also formulated in liposomal environmental which lowered tear-driven dilution in the conjunctival sac. Multilamellar vesicles from lecithin and alpha-L-dipalmithoyl-phosphatidylcholine were used to prepare liposome containing CPFX. 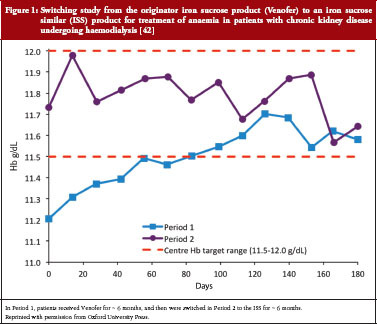 This approach produced sustained release of the drug depending on the nature of the lipid composition selected. There are many other known forms used in the industry to enhance drug penetration and bioavailability such as dendrimers, bioadhesive polymers, niosomes and microemulsions which will be discussed elsewhere. Drug delivery by topical and intravitreal routes cannot always be considered safe, effective and patient friendly. Drug delivery by periocular route can potentially overcome many of these limitations and also can provide sustained drug levels in ocular pathologies affecting both segments. Transporter targeted delivery can be a promising strategy for many drug molecules. Colloidal carriers can substantially improve the current therapy and may emerge as an alternative following their periocular administration. Ophthalmic drug delivery, more than any other route of administration, may benefit to a full extent from the characteristics of nano-sized drug particles. 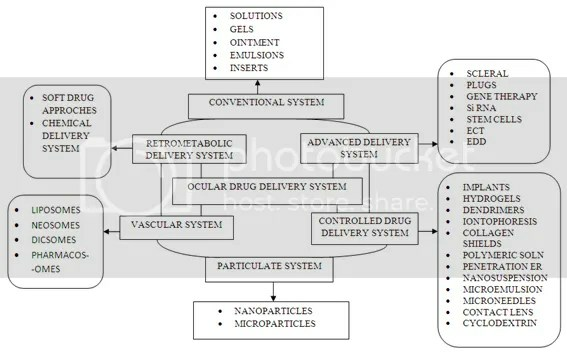 Other aspect of nanotechnology and ocular drug delivery will be discussed in the next chapter. 4. Bucolo C., Drago F and Salomone S. Ocular drug delivery: a clue from nanotechnology. Front Pharmacol. 2012; 3: 188. 5. Vega E., Gamisans F., García M. L., Chauvet A., Lacoulonche F., Egea M. A. (2008). PLGA nanospheres for the ocular delivery of flubiprofen: drug release and interactions. J. Pharm. Sci.97, 5306–5317.